To be at the height of fame and excellence. Broadly speaking, these definitions suggest that flourishing is about becoming bigger and better. Look at the definitions again—and ask yourself—am I thriving and growing well? Am I experiencing optimal levels of productivity and influence as a leader? Is my business as successful and prosperous as it could be? Is my life, business, and approach to leadership as impactful as it needs to be to make a difference? Flourishing is a wellbeing continuum consisting of four levels. At the bottom of the flourishing continuum is “Diving.” Individuals, businesses, and leaders that are characterized as diving are described as plunging downward and in a state of free-fall. Individuals and leaders report they feel like they are struggling and often feel like they can barely catch their breath, are tired, are exhausted, and fatigued. Diving businesses deal with a lot of customer dissatisfaction and complaints because products are no longer on the cutting-edge or not performing as promised. The next level is “surviving.” Businesses, individuals, and leaders who are in this state are at a critical point and vacillate between moving forward productively versus slowly spiraling downward out of control and into chaos. Surviving is investing and doing enough to just-get-by, remain afloat, hanging-on for dear life. The third level is “thriving.” Leaders, businesses, and people who thrive are more productive as they are making positive and steady progress on those critical things that matter most to them. As leaders and individuals move forward they enjoy significant rewards and fulfillment. Similarly, businesses experience more customer satisfaction and loyalty, increased martketshare growth, more productively, and increased profits. 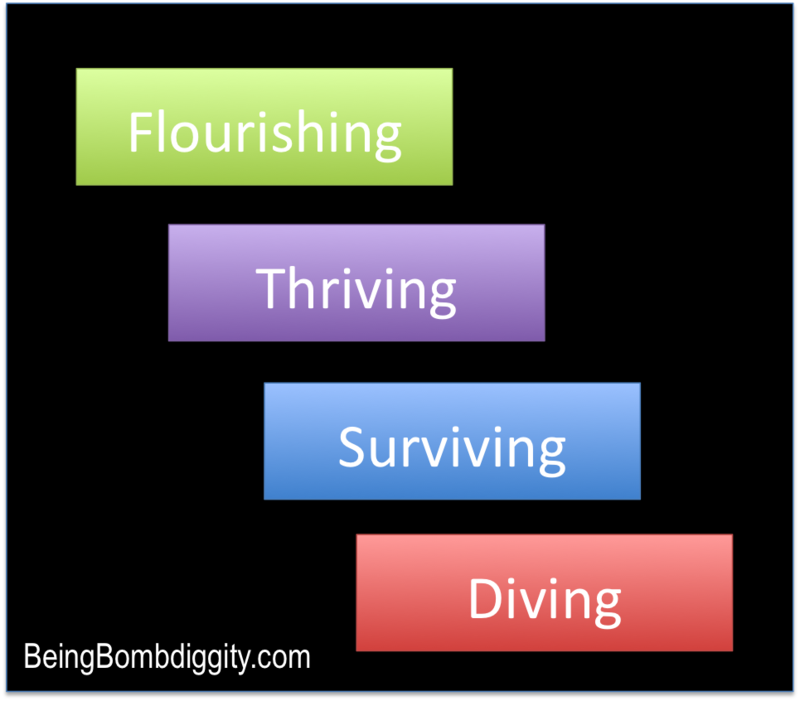 And finally, at the top of the continuum is “flourishing.” Flourishing is about being at the top of your game, reaching for something more, achieving goals that stretch, and genuinely enjoying the hard earned fruits of your labor. Individuals and leaders who flourish enjoy fantastic relationships with others, work hard to live a harmonious life between work and family, go the extra mile for their employers, and volunteer in their communities. Businesses that are flourishing are the highest performers in the eyes of their shareholders, are recognized as great places to work, receive hundreds of applications for every new job opening, and have award-winning work cultures that their employees brag about. Individuals and leaders who flourish intentionally choose to pursue every opportunity to grow, be productive, expect the best of themselves and others, maximize their sphere of influence, and perform at the best. These businesses and leaders are often labeled as winners, best-in-class, champions, market leaders, victors, blue-chip, and sometimes heroes. We label these flourishing businesses, individuals, and leaders as—Being BombDiggity!